and, if possible, bicycle tires should test out the terrain. The Drunkard’s Path should not be an invitation to drink and bike, however! 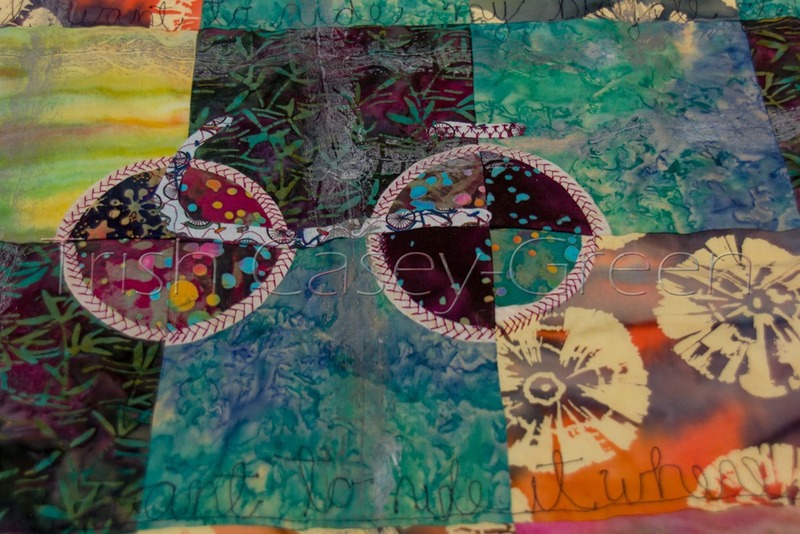 Machine pieced and quilted by Trish Casey-Green, 2015 Richmond Quilters Guild Exhibit at MAQF, February 26-March 1, 2015 The Bike Race is in RVA in September of 2015. I am missing MAQF for the first year since 2003, this is being auto-published while I am off enjoying the Grand Canyon! So, I randomly thought of other words (NEVER works, by the way. Never.) 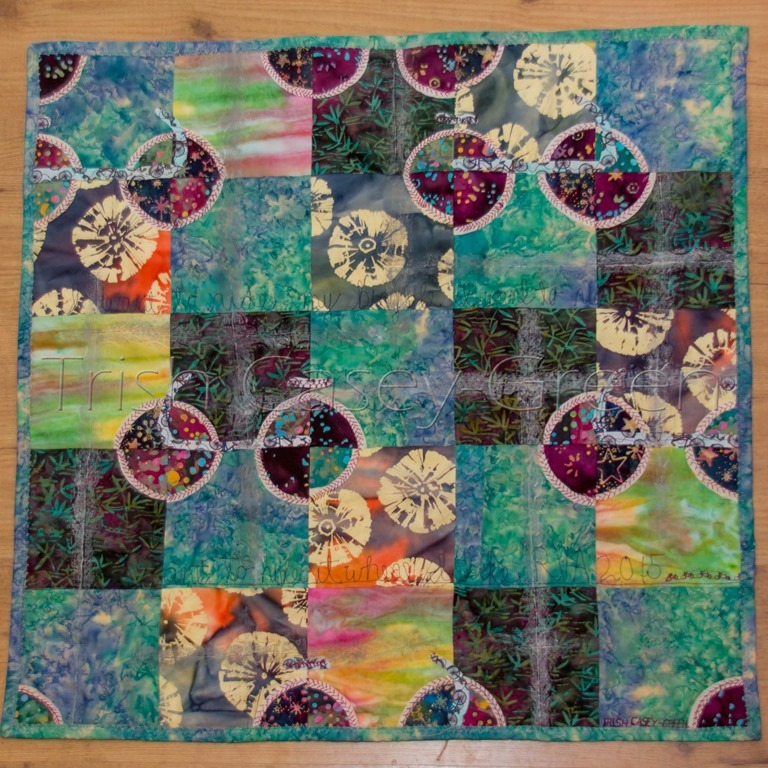 I tried,while going about my week, to figure out what CONNECT could have to to with my art, my quilting, because that is where the concept of doing a word started for me. And, yet. 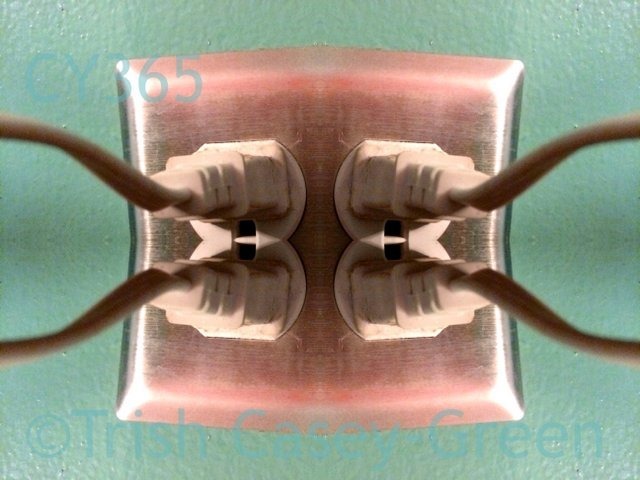 This morning–today, January 1, 2015, I looked up the definition of the word connect while getting ready to write this blog post. Well, DUH. Connect. To Join, link, or fasten together. To unite or bind. Right there, the first definition, is about quilting!!!!! 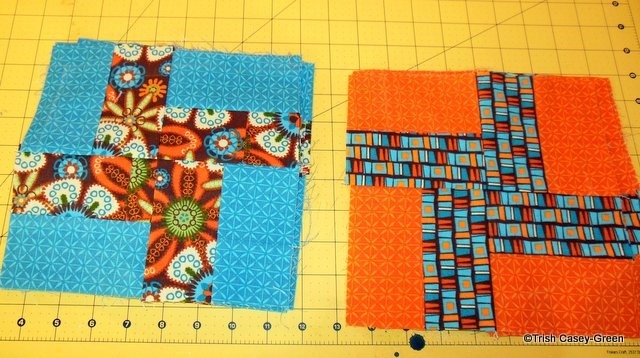 What more does one do in quilting, at the most elemental level, than attach two pieces of fabric together? And what is the last step, but to bind the quilt? (We shall not talk, today, about all the intermediate steps, of reverse engineering, running out of material, mis-measuring…) Let’s keep it classy, ok? But will this have anything to do with the bigger picture, outside the studio walls…? I shall connect with my fabric, indeed! As soon as I finish writing this post, as a matter of fact, I have to scramble to finish a project. But on the larger scale, connecting, connection; it’s the thing we all want more than anything, isn’t it? Isn’t it why we hug, or hold hands? Why we walk side by side, why the cat climbs on you the moment you have created a lap? I think making the threads that connect us stronger is a wonderful goal. There is a conversation going on over at a quilting group to which I belong. Art VS quilt, hand-dyes VS commercial, old fabric VS the latest pretties. A rather typical conversation, actually! 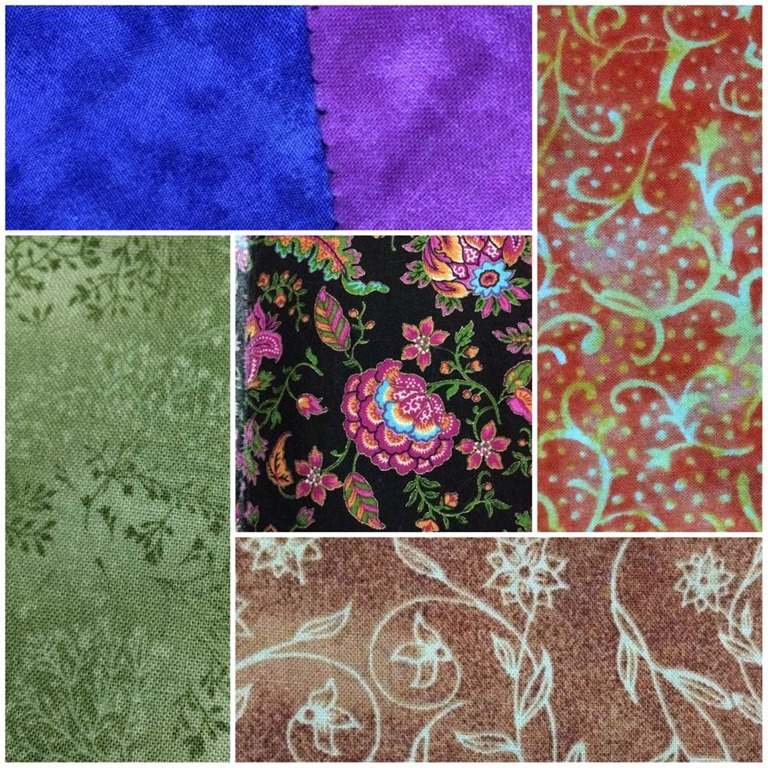 I am of the commercial collection side of the discussion, and I don’t like buying lines of fabrics, I can identify by designer only a handful of fabrics, and I don’t want ALL the newest fabrics in one quilt. To each his or her own, but I enjoy digging through my collection and finding things to pair together that weren’t meant for each other. I have this UFO that really needs to be finished. It has sat at the point where a normal person would say, take it to the quilter already. I am not satisfied with it. Something was missing. I had an epiphany last week, and know what I need to do to make it work for me. But NOT a scrap of any of the fabrics are around! 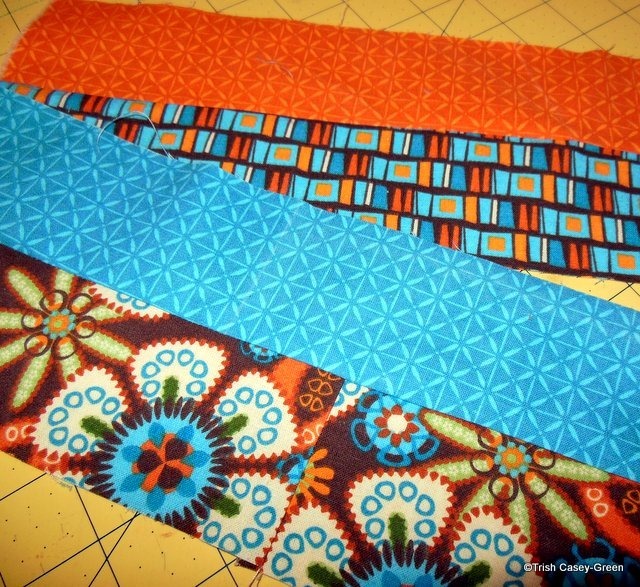 I need possibly a 12 x 12 inch square of these fabrics. 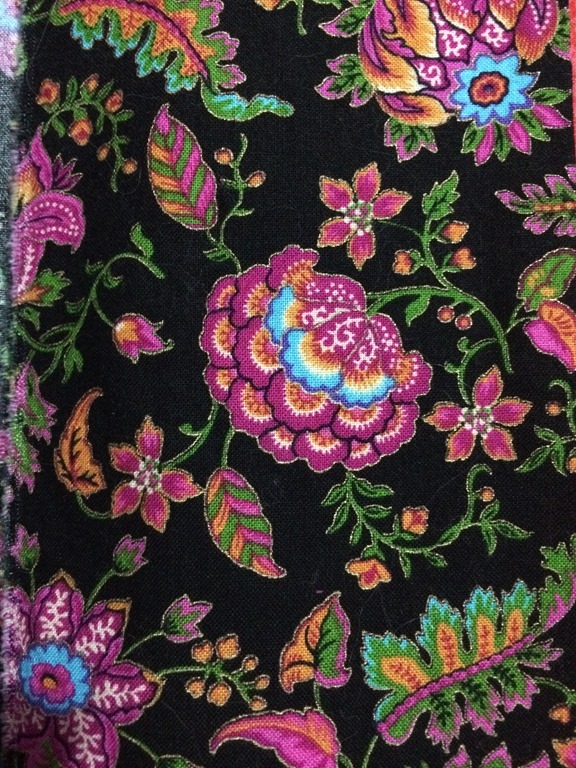 Not all of them, but definitely the black floral, and at least two of the other colors. 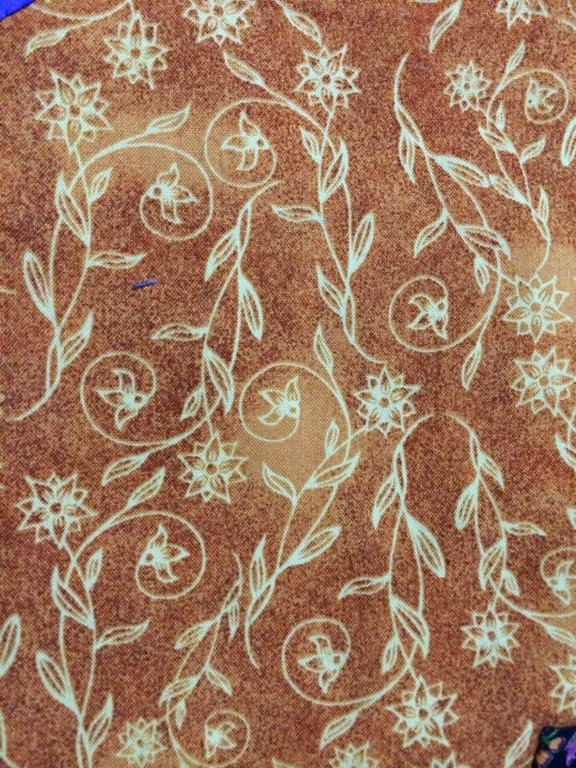 They are about 8 years old, ancient in quilt years, and I don’t know the manufacturers. Anyone recognize any of them? Anyone have a scrap or two they would be willing to give up? I have reasonable Plan B, but it is rather involved and not necessarily what I would prefer to do…. If you can help out, please contact me! This is “James”, my entry into A RVA Runs Through It, which is a special exhibit at Mid-Atlantic Quilt Fest (MAQF) this weekend in Hampton, Virginia. The Richmond Quilters Guild sponsored this exhibit, and it seemed a natural for me to enter using photography as well as quilting. “I am not a native. As a transplanted New Yorker, the songs that Richmond sings to me aren’t necessarily the same ones a native hears, and I am ok with that! (Obits in my hometown paper for a 97 year old read “Brooklyn native, brought to Staten Island as an infant.”) I get it. I love to take photos of the James River, and of things in Richmond that I enjoy. I have an outsiders appreciation of the place—I don’t focus on the political or Civil War, but I do love a lot about Richmond, and the parallel’s to my former New York life aren’t lost on me. I was born in Richmond County, New York. (More popularly known as Staten Island.) Staten Island is to Manhattan what Colonial Heights is to Richmond, VA. Manhattanites stare blankly when you say Staten Island, and when I say Colonial Heights up in Richmond I get that same vacant stare, a level of disbelief that I have wandered so far afield and north of the river. I went from the forgotten borough to the outer suburban edge of this metro area. It takes almost as long to get to downtown Richmond as it did to get to downtown Manhattan, although the mode of transport is very different. Car. Not bus, then boat, then train. The quilt came about the way most good things do. I was walking around the IQF in Houston just after Super storm Sandy, and my mind was distracted by thoughts of home, of the devastation, and I had a certain amount of survivors guilt, being there in TX enjoying life, while so many of my family and friends were battling this storm; seeing all the news reports, and just this sense of doom, and dread for my hometown, and all the places I knew so well. 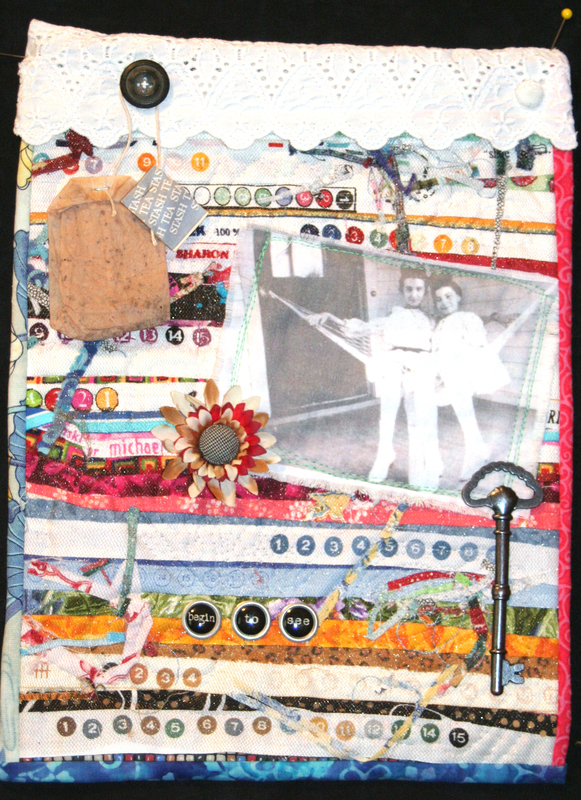 The idea for this quilt came from that day, because walking through the quilt show in Houston, my mind being pelted with an overload of visual stimulation, I had suddenly envisioned a quilt about Sandy. And, once that came to me, it broke through my inability to buy fabric, to settle on things I liked. I bought fabrics and I knew it would have YoYo’s, and I had very specific ideas, but I wasn’t totally ready to make it. 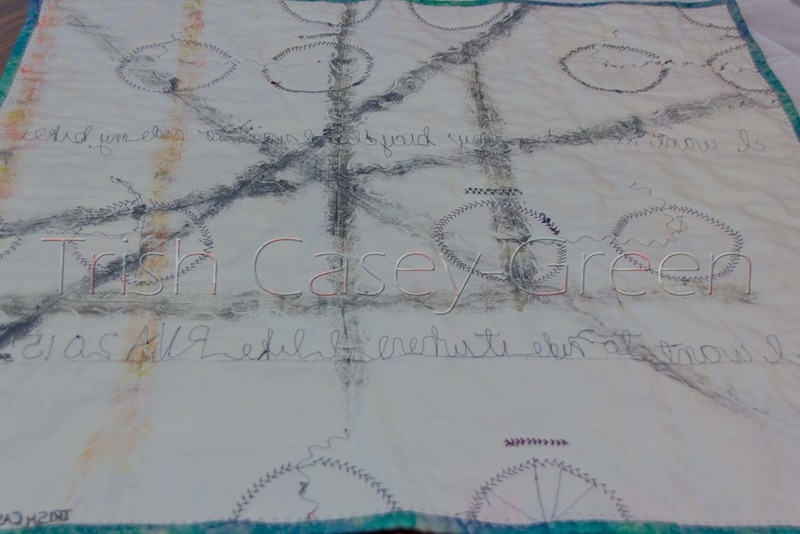 So, it sat, aging, as my quilts often do. 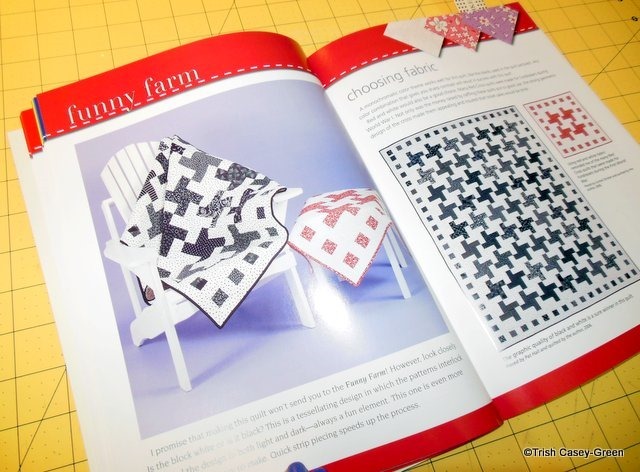 When this challenge was announced, “James” came to me, almost fully formed; so many of the thoughts about Sandy that I hadn’t yet realized just lined up and became this quilt. Sandy is still going to happen. It’s closer now, than it had been before. This piece was very much a test run. 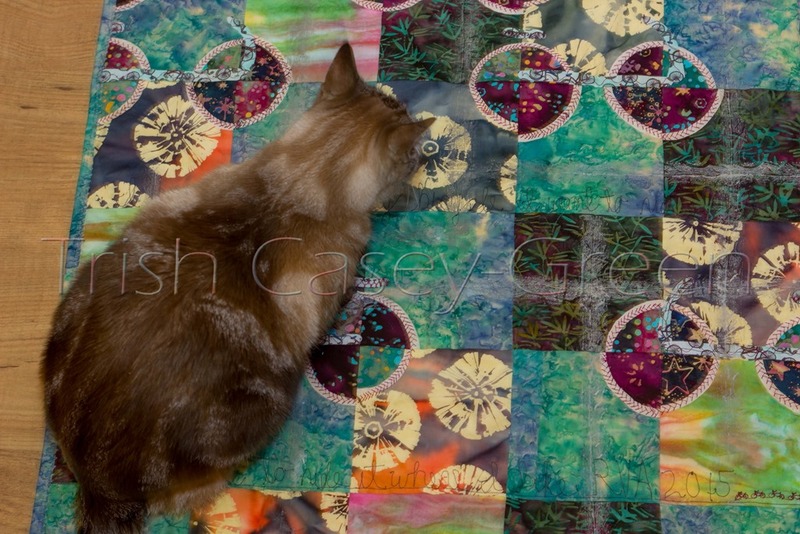 The photos on the quilt are all mine, and are all available to purchase at my website. This takes you to one page where most of the images are, but please, explore more of Richmond and more of my photos! My understanding is after this 4-day show, the entire RVA exhibit will be at a church in Richmond for the month of March. (I believe it is Shady Grove, but am not positive, nor do I have details.) Watch this space for further information. I ‘rescued’ a package of 7 fat quarters last year from a dusty shelf at Tuesday Morning. The colors were fun, but the fabric was not the best. 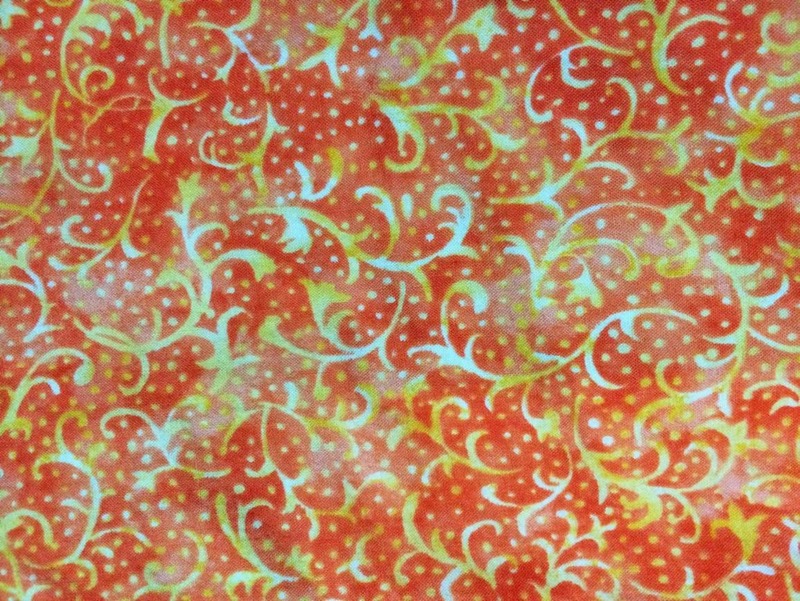 However the price, and the desire to buy fabric at the moment overtook me, and into my basket went this $5.00 bargain. As is normal for me, the fabric was washed as soon as I got it home. And of course, it shrank, it raveled, and it revealed a fair amount of fading along the fold lines. So, it was relegated to The Pile. 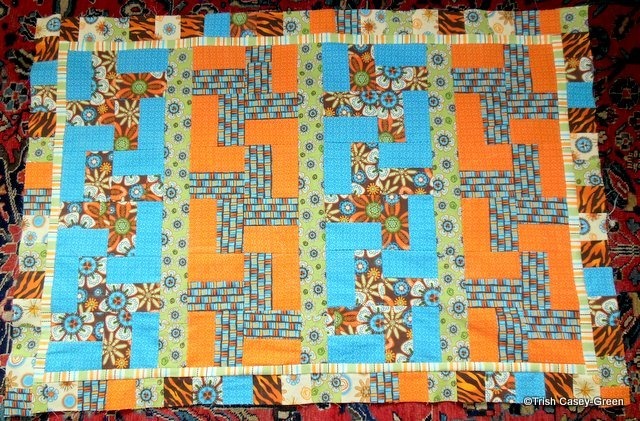 I picked it up last weekend, when I needed something quilt-y to do at our Saturday meeting. 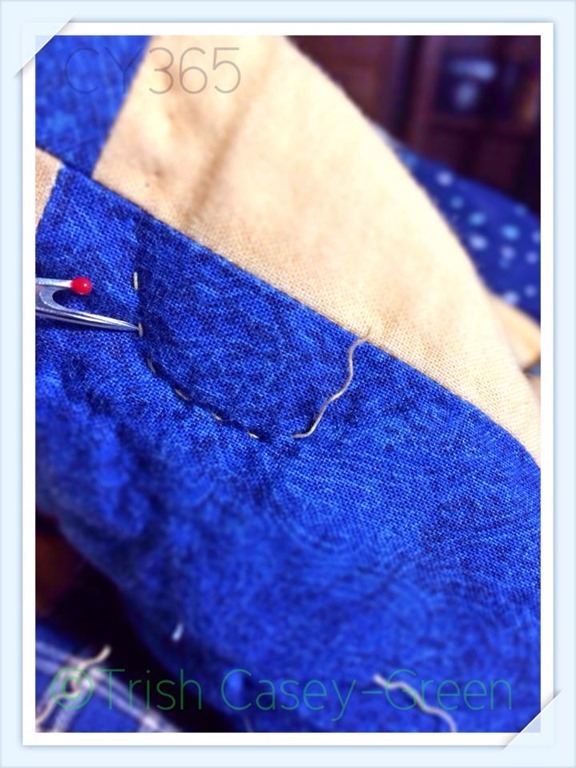 Since I wasn’t planning on sewing yet (recovering from foot surgery), I needed a plan. I gathered a handful of books and grabbed that fabric. I decided I would make a charity quilt with the fabric. Simple shapes, nothing with points that may not take well to the quality of material, and of course, I didn’t want it to end up as another UFO, so it needed to be a day project. 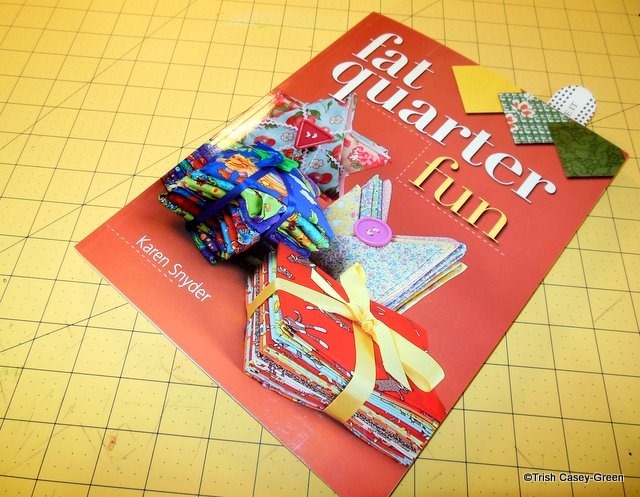 in Karen Snyder’s book Fat Quarter Fun. I knew immediately upon seeing it that it satisfied the criteria I had established. I also knew that the pattern was very much going to be about inspiration and very little about following the directions. Instead of the same color background, I chose the ‘almost’ solids. I knew I wouldn’t be able to replicate the tessellation perfectly because of that, so I planned to use a fabric to separate the rows. Strip piecing 2.5 inch strips. 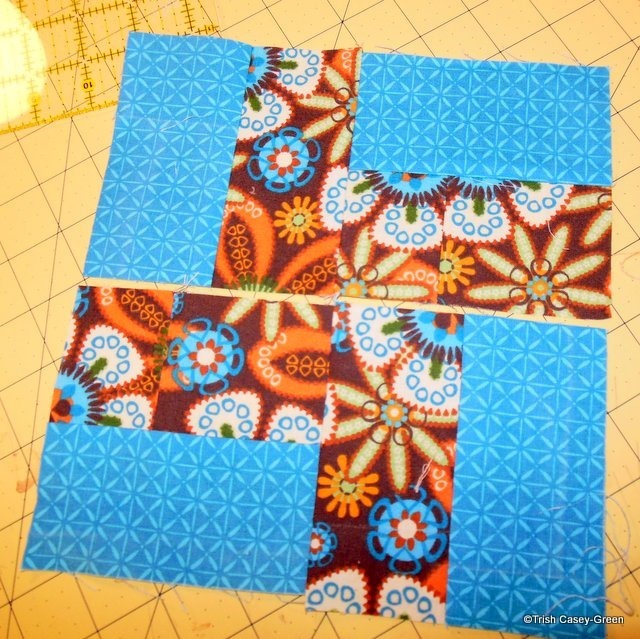 Cut into 4.5 inch squares. Resembled into blocks. 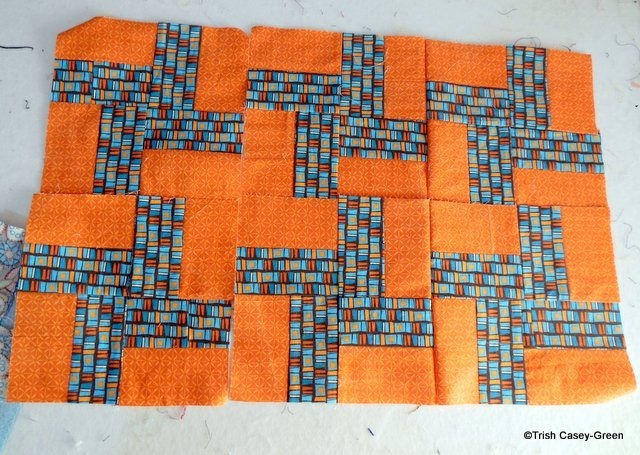 (Here, I didn’t pay attention to the order I worked, and so ended up making one set reversed, but I wasn’t stopping to fix, since I wasn’t planning on a tessellation anyway. This is a nice baby sized quilt. 7 fat quarters! One afternoon! Both Aunt Gene and my great grandmother Miriam suffered from Alzheimer’s. To say they were eccentric is to put it mildy….Aunt Gene lived in this house from childhood till her mid 80’s. No one was EVER allowed upstairs. I remember there being strings of used teabags hung across the window by the back door, so they could be used more than once. They washed their tinfoil. Aunt Gene never tossed a plastic container away.